Whenever I’m somewhere “new” or different from my usual route of home to gym to work to home, I always, always check out any nearby bakeries and restaurants. Case in point, I went to my company’s annual user conference in San Francisco for a few days in June and I whipped out my phone to see what top-rated bakeries were within walking distance of my hotel. If you remember my perambulations from my New York City trip, you know “walking distance” to me has a wider range than most people. I’ve walked 5 miles for a cookie in case that gives you context. Fortunately, in this case, I found a bakery just under a mile away from where I was staying – totally doable distance on two legs. And it wasn’t just any bakery. In googling “top rated bakeries” near my hotel, I came across a link for an article that listed “100 Foods to Eat in San Francisco Before You Die”. My first instinct was to take that as a personal challenge and see how many I could knock off the list before I went home. Then sanity prevailed. I was there for work, after all, and only had a limited time to work on my foodie bucket list. I had to prioritize. Serendipity had it though that one of those items was the cruffin from Mr. Holmes Bakeshop. I’ve had cruffins before. Following in the wake of Dominique Ansel’s famous cronuts (croissant + doughtnut), a cruffin is – you guessed it – a cross between a croissant and a muffin. In addition, I found another foodie article that lauded the chocolate chip cookie from Mr. Holmes’ Bakehouse, calling it “the best chocolate chip cookie in San Francisco.” Whoa. Talk about waving a red flag in front of a twitchy bull. I can’t pass up that kind of challenge, especially when it was just a mile away. Want to know how nuts I am, how seriously I take this kind of thing? Perhaps only another foodie would understand. Mr. Holmes’ Bakehouse opens at 7 am. I had to catch the shuttle for my conference at 8:30 am. I needed walking time to the bakeshop, enough time to buy my products, meet my coworkers at their hotel and walk to another hotel to catch the shuttle. Not only that but I wanted to go for a run before I went to the bakery because, let’s face it, a mile walk there and a mile walk back wasn’t going to be enough of a calorie burn to work off what I had planned to buy. So I ended up getting up at 5:15 am, was down in the hotel gym by 5:30, ran 4 miles on the treadmill, did a cool down, showered back in my room, got ready for the conference then headed out to get to the bakeshop a little after 7 am. My timing was pretty good, although I was ready to stick my face directly into the display case because I was starving by the time I got there. 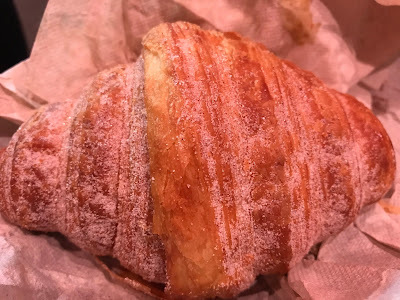 Unfortunately, cruffins weren’t going to be ready until 9 am but that was okay since I ended up getting 2 churro croissants, a pain au chocolat, an apple monkey bread and one of the famous chocolate chip cookies instead. What? I planned to share with my coworkers (and actually did, I’ll have you know). The pain au chocolat didn’t even make it onto the shuttle bus. While I waited for my coworkers in the lobby of their hotel, I polished that sucker off first thing. I’ve made pain au chocolat before and while they’re not that hard to make once you have the dough, they’re still enough of a pain (haha) to make from scratch that I’d rather buy them than make them. The key to a good pain au chocolate isn’t just having flaky croissant dough but also using high quality chocolate sticks as the filling. The one from Mr. Holmes was super flaky, almost a little too much so since it made for some messy eating. I’m enough of a foodie that I didn’t care that much of the sight I made, hovering over the pastry box while trying to keep flakes of my pain au chocolat from decorating my front. Dignity has no place when enjoying a good pastry. Apple monkey bread – super delicious. I like monkey bread, I like apples. Together they made a nice combination. I wish I’d gotten 2 of these and only 1 of the churro croissants. Churro croissants – nice, flaky croissant, outside was covered in cinnamon sugar to align with the churro billing. The inside was filled with some kind of cream filling. It was good but I have to admit there was too much of it for me. I’m not big on cream or custard-y desserts except for crème brulee and there was an awful lot of filling in the croissant. Chocolate Chip Cookie – I don’t know if this is THE best in San Francisco (I’m willing to try others for research purposes) but it was a pretty good cookie. It was thick, it had a delicious caramelized brown sugar-butter flavor and it was chewy. I did end up sharing this with 3 other people as I couldn’t finish the whole thing by the time I got around to eating it. No surprise considering all the pastry I had consumed earlier that day. But wait, I ate more. I couldn’t be this close to the famous cruffin and not actually try one, right? Fortunately I had a later start the next day since we were going well into the evening for the conference so I was able to get to Mr. Holmes Bakehouse right at 9 am when the cruffins were being put out. There was a small line outside the shop as others were waiting for the doling out of the daily cruffin. 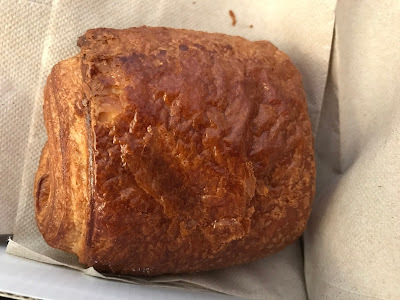 I bought one (by that time, I was still swimming in buttery, flaky pastries from the day before so one was sufficient as a taste test) and ate it later that morning. I’m not quite sure how I feel about the cruffin in general. Honestly, it seemed more like a croissant but just forced into an unnatural muffin-like shape. It had all the prerequisites of being flaky and tasting like a croissant and not so much of the muffin qualities. This also had an inordinate (to me) amount of filling in it – something like an orange cream. I discovered later that they do different flavors of cruffins just like Dominique Ansel does a different flavor of cronuts every month. If I was more of a cream filling person, I’d probably have liked this better. Don’t get me wrong – it was good and very well-made. I’m glad I tried it. But I would probably stick to the pain au chocolat and apple monkey bread if I ever went back. Still, check on the foodie bucket list for having a cruffin from Mr. Holmes Bakehouse. 99 more things to eat in San Francisco to go.